If you are having a hard time cutting up a large piece of meat at your home, you should definitely think about getting yourself the best meat slicer you can buy in today's market. I for one have struggled with cutting large racks of meat into even pieces, which is why I decided to get a meat slicer for to get even cuts, and to save a lot of time. Don't worry if you don't have any idea about meat slicers, because for this article, I will share with you a couple of tips on how to choose the best meat slicer as well as a list of reliable products you should check out before making a purchase. Which Meat Slicer Should You Get? Meat slicers come with different features and functions. To make sure that you are getting your money's worth, you must take note of these factors when choosing a meat slicer. Doing so can save you a trip back to the store, and will ensure that the product you get will fit your needs and preferences. If you are planning on cutting a small amount of meat, and if you don't plan to cut meat frequently, you may do just fine with an entry level meat slicer. Entry level meat slicers are light, cheap, and can be great for cutting thin slices of meat, vegetables, and cheeses. However, if you are planning on cutting a large amount of meat every now and then, you should invest your money on a high-end model that has stronger motors that can cut through any type and any amount of meat without wearing out its parts and motor. Entry level meat slicers come with small 9 to 10-inch cutting blades that are great for home use. Mid-level and high-end meat slicers on the other hand come with a more versatile cutting blade with sizes ranging from 12 to 14-inches, making it great for all around use. If you plan on slicing meat that is larger than 12-inches, you should make sure that the meat slicer you choose comes with a large product tray that can accommodate the meats you are going to slice. Keep in mind that most meat slicers come with 7 to 12-inch product trays, so it might be a little difficult to find one with a product tray that can accommodate meat that is larger than 12-inches. Of course you would want to get a product that has a variety of safety features especially when the product you are getting requires you hand getting close to a sharp spinning blade. When looking for a meat slicer, you should get one with a knife guard to prevent cut accidents and a gauge plate interlock that will require you to set the gauge plate at zero in order to remove the product tray. Another thing you should look out for are meat slicers that come with a handy food pusher so that you wouldn't have to put your fingers so close to a sharp spinning blade. This machine also operates at a low noise level that will eliminate your worries of disturbing your neighbors or people sleeping in your home. What's more is that it's very easy to clean and maintain. If you choose to get this meat slicer, you will also get 2 whetstones that you can use to keep your meat slicers blade sharp at all times. The T﻿﻿an﻿﻿gkula 7.5" Electric Commercial Professional Deli Meat Slicer might be the one for you if you are on a tight budget, or if you don't plan on slicing large sizes and amount of meat frequently. For added safety, this meat slicer comes with a plastic food pusher so that you wouldn't need to put your hands close to the blades. It also comes with nonslip feet for added stability when slicing meats. What's more is that this machine has a removable sliding table that will allow you to clean and maintain this machine with ease. 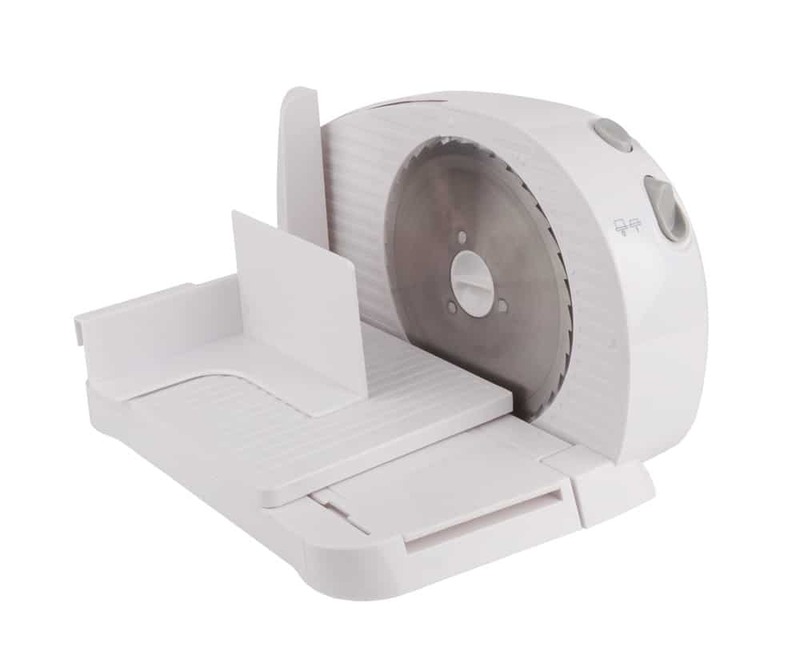 This meat slicer can significantly help you slice large amounts of meat really quick with its 6-inch premium stainless steel blade that is powered by a 200-watt motor. Though this machine runs with a powerful motor, you would be surprised as to how quiet this machine operates, making it great to use even in the early hours of the morning. This meat slicer will let you cut meats, vegetables, fruits, and cheese up to 4-inches thick. It's also great for beginners since it comes with a numerical scale knob you can use to easily adjust the cutting thickness. What's more is that its blade's sharpness is easy to maintain since it comes with built-in dual whetstones that keeps the blade from being dull. The Chef's Choice﻿﻿﻿ ﻿﻿﻿615 Premium Electric Food Slicer is a great meat slicer you can use at home since it comes with a 7-inch stainless steel blade that will let you cut through small and medium sized meats with ease. This machine can let you cut up meats, vegetables, and cheeses into deli thin slices up to ¾-icnh thick slices. This machine is also great for beginners since it comes with a titled food carriage for fast, efficient, and precise slicing. It also includes a metal food pusher as an added safety feature so that you wouldn't have to risk putting your fingers too close to the blade. This product is also very easy to clean and maintain since most of its parts including the blade, food carriage, food pusher, food deflector and thickness guide plate can easily be removed for cleaning. Another budget friendly meat slicer is the Chef's Choice 609 Premium Electric Food Slicer. This machine can be perfect for you if you plan on slicing meat occasionally. This machine has a 7-inch blade that can let you cut small to medium sized meats into deli thin slices or ¾-icnh thick slices. It is also great for meat slicing beginners because it comes with a tilted large capacity food carriage for added precision when slicing. This machine is also very easy to maintain and clean since its blade, food carriage, food pusher, food deflector, and thickness guide can be removed for cleaning. What's more is that this product comes with a 1-year manufacturer warranty. Of all the meat slicers I have mentioned in this article, you should definitely check out the KWS Premium 200w Electric Meat Slicer. Though it does come at a rather hefty price tag, it will surely be worth your hard earned money because of its powerful motor that can let you cut large amounts of meat whenever you want. It's also made out of durable parts that will make it last for years. If you liked this article, and would like to know more about other cookware, please leave us your feedback in the comment box below. Until next time, enjoy!